When realism isn’t real, where is a writer to go? Meaning, the sentence is a construction which feels at least as habitable as the bus which carries a poet to an unfamiliar town, and the couch upon which the poet sleeps later that night. When realism isn’t enough, isn’t authenticated or represents a fractional or purely outward series of events, poets turn to the body of the sentence upon which to recline, repose, deconstruct and reject any sort of frame which insists upon the “real” being limited to finite perceptions. A sentence may break, with the force of bodily gesture, something more fluid. When I think of the poet’s novel I think of an oblique truthfulness. The choreography of Pina Bausch comes to mind, as an example of art which echoes the interior and bodily aspects of the real. What is the difference between realism and the real? I’d like to preface these remarks by saying that this commentary is in no way a critique of realism, but instead a depiction of a category of the real which attempts something entirely different then say, a realistic novel evoking a specific time and place. In the work of Pina Bausch we are called to question: how does the real manifest in the body? How does the real impel a body to move? How do we represent the unsayable? Take the following quiz to find out some of your own preconceptions and expectations about modern dance. a. Stand up straight and remain clothed. b. Writhe on the floor with eyes closed. c. Manually pick up their legs and move them, as if they were unable to move them in any other manner. a. With eyes open upon tidy even surfaces such as stages, free from hazards. c. On trains, on streets, while pushing lawn mowers. d. With eyes closed while running across a stage crowded with chairs and tables. c. Spitting mouthfuls of water onto each other’s faces while lying down. d. Examining each other’s teeth and hairlines. e. Embracing, lifting, and dropping each other to the ground. If you answered “a” to all of the above you may want to stop reading here. 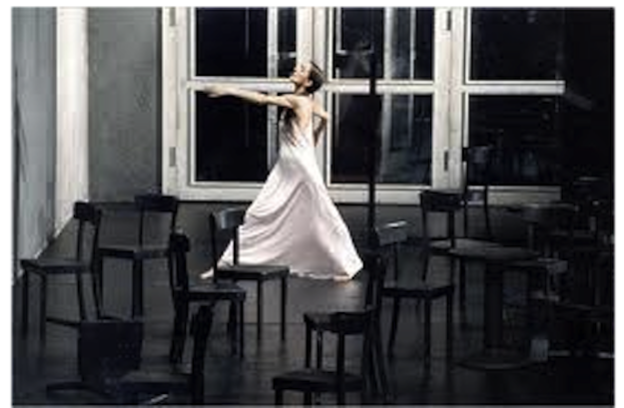 If not, you might have a sense of how I hope to draw connections between the choreography of Pina Bausch and the poet’s novel. Can text move in the same visceral way as a bodily gesture? Does one stand up straight in a dance or a text depicting hollow uncertainty or emotional turbulence which follows trauma? What is a sexual text, a violent text, or one which erupts, breaking with expected notions of how one proceeds to represent an aspect of reality which exists primarily in the consciousness? The poet’s novel is the one that stands up and yells something inappropriate during a public lecture. It is also the novel that remains in its seat quietly, yet describes the impulse to scream at various moments, whether or not one does scream. The poet’s novel is the one which might spend three hundred pages contemplating whether one might scream. The inner life is not a series of events. There is no replacement for invisible gestures which occur all day, every day, akin to music, bodily breaking apart sensation, perception, and attempts to make sense of the myriad of non-sensical happenings which surround us. This mud is the same mud poured onto the stage in Bausch’s Rite of Spring. Perhaps the water which completes the mud is the water on the stage in Bausch’s Full Moon. There is so much water that dancers actually swim across the stage. The elements are essential to both artists, and not the elements in the abstract, but the tactile possibilities of mud. What does it feel like to cover oneself in mud upon a stage? If a writer is “feeling for the invisible” in mud she will probably be there for awhile. Mud becomes not prop but companion, mask, medium of investigation, and reminder of what we are made of. The elemental suggests a brooding as well on mortality. If we aren’t so separate or different from what surrounds us that is because we return to it eventually. What is plot? Is it a woman standing and looking at a closet for two hundred pages, as in The Passion According to G.H.? Could it be the life of a poor girl from North Brazil, who comes to Rio and remains poor, weak, unattractive, lonely (so lonely she takes to kissing walls), until her death when she is run over by a car, as in The Hour of the Star? Or is a better example of plot, in Lispector’s works meditation on consciousness in place of any character development at all, as in the excerpt below, from the first pages of Agua Viva. The poet’s novel is the “untellable instant, larger than the event itself.” If a feeling is both “immaterial” and “objective” its seeming to “happen outside your body” only complicates an already many-tiered experiential reading or receiving process. When viewing a dance by Pina Bausch, we are well aware that the physical movements made by the dancers are not in themselves the “feelings” or “events” and yet clearly, they capture, suspended for brief moments, the reality of the resonance of bodily experience— of the “untellable,” —like a body in a novel unmoving, yet redolent with thought. 1. Rachel Kushner, “Lipstick Traces Novelist Clarice Lispector’s radiant nothingness” (Artforum International Magazine, Bookforum, New York), 19:4, 18. 2. Clarice Lispecter, Agua Viva, trans Stefan Tobler (New Directions, New York, 2012), 4.